As seen on the Superstar Shake-Up, former NXT Tag Team Champions, SAnitY were officially disbanded, with the group's leader Eric Young being drafted to Monday Night Raw from SmackDown Live. Shortly afterward, Young's former stablemate Killian Dain took to Twitter to post an emotional message thanking his former tag team partners. SAnitY first made their debut in 2016 when the group entered the Dusty Rhodes Tag Team Classic Tournament, as both Alexander Wolfe and former member Sawyer Fulton represented the stable in the tournament. The group's leader Eric Young also made his NXT debut under SAnitY and Nikki Cross featured as the only female representative of the group. However, following an injury to Fulton, Irish superstar Killian Dain joined the ranks of SAnitY and was revealed as the group's newest member in early 2017. Later in the very same year, SAnitY defeated The Authors of Pain to win the NXT Tag Team Championships and in the 2018 Superstar Shake-up, SAnitY was officially moved up to the main roster as part of SmackDown Live. 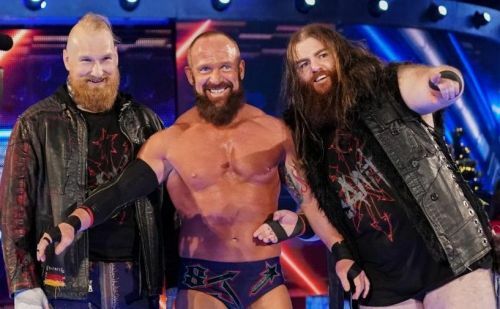 Almost a year since their call-up to the main roster, popular NXT faction SAnitY has now officially disbanded, as the group's leader Eric Young has been drafted over to the Raw roster from SmackDown Live. With the official separation of SAnitY, Killian Dain took to social media and sent an emotional message to his former stablemates. 'The Beast of Belfast' wished good luck to both Young and Wolfe and added that he is definitely going to miss both men. Further, Dain elucidated that he had the best time of his life as part of SAnitY and credited both men as amazing people inside and outside the squared circle. Finally, Dain thanked everyone who had supported SAnitY. With Eric Young now on the red brand, it'll be interesting to see what the future has in store for both Dain and Wolfe, who are still on the SmackDown roster along with Nikki Cross. For the past few months, SAnitY haven't really done anything of note.